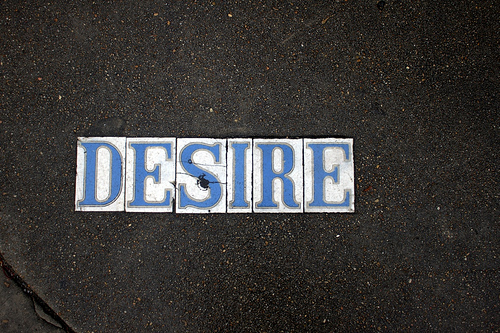 Desire is powerful. Not a symphony has been written, a mountain climbed, an injustice fought, or a love sustained apart from it. Desire is the trigger behind our deepest passions and it is the motivating factor that has caused me to chase after ridiculous and often dangerous goals. Although it has driven me to accomplish a number of items on my bucket list, I realize that desire has also been the framework for all of my failures and letdowns. In addition to causing heartache, desire is often the culprit for fueling immoral and sometimes illicit behavior. As a result, many of us play it safe by living far from our hearts, and we do so at the expense of our happiness. By disowning our desire and reducing it to a more manageable size, we sacrifice our hearts on the altar of “getting by” and in return, we are forced to settle for less than we deserve. What if that’s not how we were meant to live? What if I told you that we were made to desire? Well, we are! Just as our lungs were made to breathe oxygen, our souls were designed to constantly seek and spar for meaning, intimacy, and adventure. In fact, not only were our souls designed to desire something greater, they were also designed to be satisfied by something greater. Jesus never said “the problem with you people is that you want too much. If you’d just learn to be happy with less, then we’d all get along just fine.” Quite the contrary. What he really said was that he wants to give us life to the full. You see, we were purposefully given a heart that desires deeply because he uses those desires to draw us to himself. The intimacy, romance, adventure, courage, purpose, and joy that you long for is only a glimpse of what you will get after your time is up. So don’t suppress any of these desires that you may have, but embrace them. Even if you tried, turning your back on the things that your heart longs for would be as futile as holding your breath for an extended period of time. Eventually you would find yourself gasping for air. So will life ever be what I so deeply want it to be, in a way that cannot be lost? The simple answer: not yet. It’s a sobering truth, and yet it makes all the difference in the world because desire cannot live without hope. It puts my entire bucket list of goals into a different perspective, and yet still fills me with joy because I know that the life I prize is coming. The very thing that I am aching for now is exactly what will be given to me when I am finally called Home. I have to remind myself often that this life of desire is not a road headed toward completion, but a process and a journey followed by absolute and perfect satisfaction. Through this wonderful reminder, I am freed from feeling like a failure when things are not finished, and hopeful that they will be as my journey comes to an end. Therefore, let your desires endure, let your passions persist, and be bold with your aspirations. Life is not a problem to be solved, it is an adventure to be lived, and I can’t wait to drink deeply from that fountain of which I’ve only had a sip.